Player You Admire Most: Ciaran Herron. 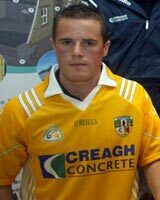 Most Difficult Opponent: Damian Hayes – Galway. Advice to Young Players: Keep your head down and work hard at training. Favourite TV Programme: Top Gear. County - 2 Senior Ulster, 1 Minor, 2 Under 21 C'ships.